Advanced Nurse Practitioners in Acute Medicine dept at Aberdeen Royal Infirmary. When I was asked to write this blog I wondered how to go about this. As I work as part of a large team of ANP’s, we decided on the team approach so we could all have our say. We are a large team of ANP’s and trainee ANP’s that work within the Acute Medicine dept in Aberdeen Royal Infirmary. Currently, we have 17 ANP’s and trainees combined although this will be expanding over the coming weeks with new recruitment. We work 10 hours shift in conjunction with the medical rota and we aim to provide flexibility for working families so we have full and part time staff. Our ANP’s have completed their MSc’s in advanced practice and our trainee ANP’s are currently undergoing their MSc’s in advanced practice. Currently, we wear the national uniform for trained nurses. We have trialled polo shirts in an attempt to differentiate us from the ward staff, however, have found little benefit from this. We have liaised from our colleagues in other parts of Scotland who have opted to wear other uniforms to help the patients understand that ANP’s are there to provide an advanced level of care. We would all agree that nationally more needs done on this topic. Our role within acute medicine covers 4 different areas. These include; AMIA, AEC, SSMU & Admission triage. Acute Medical Initial Assessment (AMIA) is the unit patients are admitted from GP’s with medical issues that are likely to require in-patient investigation and stay. Working alongside the medical team we clerk, patients, examine patients, perform necessary investigations. From this, we decide on a management plan and initiate treatment. The patients are then referred to the appropriate specialty after Consultant review and they are handed over for on-going care. Ambulatory Emergency Care (AEC) is attached to AMIA. This role is fully autonomous for the ANP but there are Consultants available for advice and review when needed. This part of the unit allows us to treat patients we could investigate and manage on the day or an out-patient basis. You would be surprised what we ambulate. Some of the patients we see within AEC are patients with DVT, PE, chest pain, cellulitis, acute headache, syncope, pneumonia and many more. We are putting patients first by allowing them to be fully investigated and treated without a hospital stay which many patients prefer. Short stay medical unit (SSMU) this unit is run by the same medical team who work in AMIA, our role within SSMU is the same as the junior medical staff. We are responsible for the on-going care and management of medical patients who are likely to have an admission of less than 72hrs. Admission triage. There is an ANP or TANP assigned to this role daily. We answer the calls from GP’s that are looking to admit a patient. At this point we triage them to the appropriate area. This may be AMIA, AEC or another specialty. If the patient is coming to acute medicine then the ANP will request initial investigations based on the history given over the phone. This allows the Healthcare support workers within the team to initiate IV access, bloods and ECG on the patients’ arrival to avoid any delay. We are also available for advice to our colleagues in Primary care. 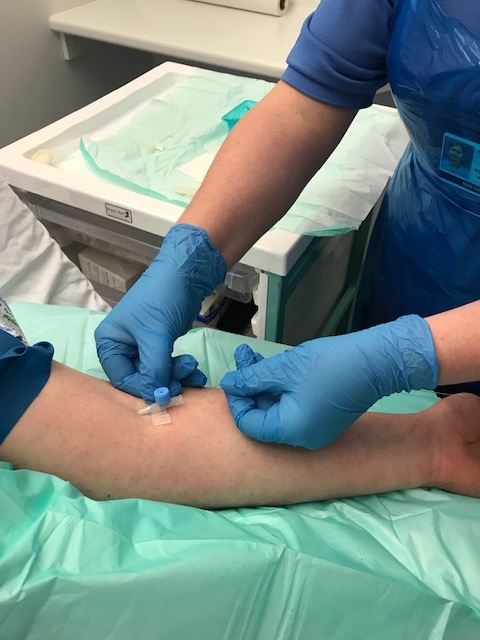 Extended roles provided by the ANP team include; Lumbar punctures, Picc line insertion, Advanced Life Support providers, ascitic and pleural taps, initiation of Non-invasive ventilation (NIV). We have also embarked on the Focused Acute medicine ultrasound course (FAMUS) which allows us to provide point of care ultrasound for the on-going management of our patients. It has been standardised within the ANP team in Acute Medicine that full MSc in Advanced practice is required and all of our trainees are working to complete this presently. We have a mixture of RGU graduates and Dundee university graduates. As part of our on-going development within the 4 pillars of practice, we are also participating in the European Prevention of Alzheimer’s Disease (EPAD) study which looks at preventing the development of dementia in biomarker positive people. We are the only ANP team in the country presently that is providing Lumbar punctures for this study. We are also involved in identifying and driving the need for change as well as provide clinical education to our colleagues. What difference has our MSc’s made to our practice? It helps us promote evidence-based practice. We all agree that we feel more confident to challenge and be analytical about policies and guidelines. We all feel equipped with the knowledge of looking at current evidence and ascertain if practice and policies need to be improved. Having this ability has left us feeling empowered to make changes in practice and policy. As a result, we continue to develop our service and hope to continue to improve patient care. What advice would we give to nurses wishing to pursue a career in advanced practice? Consolidate your pre-registration training and work on becoming a staff nurse before you jump into advanced practice. Try and gain a broad range of clinical experience before embarking in advanced practice as this will bode you well through your ANP training. If you have a good grounding on how to manage patients as a staff nurse the next stage of training will feel more like a hill than a mountain. Do the whole MSc. You know the time will be upon us soon that it is standard practice nationally that we require an MSc and we will be on the NMC register as ANP’s. Yes, this means a lot of studying but it is worth it in the end. Don’t be afraid to take a break and enjoy things away from work and university life. Make time for you, your family and friends and they will not feel neglected during this time. They are also more likely to support you through the process this way. Also if you are returning to studying after many years, don’t panic about moodles and essays as there are lots of people on hand to support you through this process. Study skills are amazing! Organise your time so you don’t feel overwhelmed and feel you are missing out on life. Learn from your colleagues experience and don’t be afraid to lean on them for support. We hope that this encourages more nurses to study advance practice. Are you interested in advanced practice? RGU offer MSc Advancing Nursing Practice allowing experienced nurses or midwives to develop their skills and knowledge required for advanced practice.